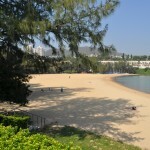 After our family moved from Hong Kong Island to Discovery Bay in 2010, I soon realized how difficult it was to find products such as picnic mats to enjoy our new environment. Looking for a new challenge, my first batch of unique handmade picnic mats and beach bags were sold out at my first Discovery Bay Fair in 2010. ASHNI (named after our gorgeous daughter) was launched! After the initial success, my range quickly expanded to over 50 products, including swimming bags, beach mats, lunch bags, pencil cases, teepee tents, canvas bags, embroidery service and much more.. I specialize in using durable fabrics with an extensive waterproof range which are ideal for both indoor and outdoor use, custom size or custom fabric combinations are also available on request. A full embroidery service including names, applique, corporate or club logos or custom designs are available for the personalized touch. Created in Discovery Bay, ASHNI continues to innovate and pioneer, being a source of inspiration to others. Look around and make yourself at home!